The future of work is upon us. All over the world, workers are ditching traditional office spaces and seizing the opportunity to work remotely, finally stepping away from the monotony of the 9 to 5. In the UK alone, there are currently well over 1.5 million regular remote workers, with the latest ONS figures showing that flexi-time increased by 12.25% from 2012-2016. Due to this sudden change in workplace trends, modern businesses are having to evolve and adapt. Instead of demanding employees make the daily commute into the office, they’re now utilising innovative technological advances to ensure teams can collaborate at a time and place that best suits them. Web conferencing platforms, such as LoopUp, are proving particularly popular for this purpose, with remote teams able to hop into a quick conference call to share new ideas, discuss project improvements and strengthen working relationships. But why are these platforms proving so effective? 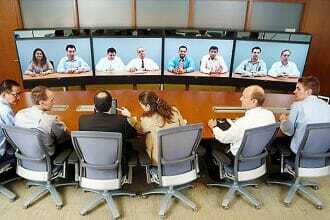 In short, web conferencing allows you to conduct an online meeting with multiple participants. The more popular solutions provide audio and screen sharing capabilities, ensuring attendees can always keep up with the progress of the meeting and join in with the discussion—without the need for being in the same room. Employees and clients can join web conferences from remote locations, with most platforms working across a range of desktop and mobile operating systems. When conferencing software has been installed, businesses no longer have to worry about installing large conference areas; while also stand to save money on travel expenses and improve the productivity of their staff. Improving engagement, flexibility and encouraging continuous collaboration, web conferencing has become a staple of the modern business. The remote working phenomenon isn’t stopping any time soon. A recent Total Jobs study found that 25% of UK workers would actually change jobs if they weren’t allowed to work from home, while research from Buffer reports that 90% of remote workers plan on working remotely for the rest of their careers. In fact, figures suggest that over half of all UK employees will work remotely (at least some of the time) by 2020. Fortunately, modern web conferencing platforms ensure these remote teams can continue to collaborate and communicate effectively. Web conferencing ensures remote teams can stay connected everywhere. Working across a range of desktop and mobile devices, modern conferencing platforms make communicating easier than ever before, providing attendees with the flexibility to join from a convenient remote location. Instead of worrying about large travel distances and physical barriers, remote workers can now join meetings through the simple press of a button, ensuring they always feel like part of a team with access to the support and advice they need. However, it’s not just all about making things easier for remote workers, because web conferencing is also known to improve employee engagement in meetings. Traditional face-to-face meetings are prone to frustrating delays and distractions, often starting late and running well past their allotted time. In contrast, online conference calls significantly reduce the risk of these distractions, ensuring meetings become much more focused and efficient, while also providing remote attendees with the tools they need to actively participate. Instead of simply listening to a one-way presentation, web conferencing allows remote workers to share screens and truly get involved with the discussion, making the entire meeting experience much more valuable and productive. Although the Buffer survey found that 21% of remote workers believe it’s harder to collaborate when outside the office, conference calling can actually improve on those in-house meeting experiences. By implementing web conferencing technology, remote workers can get together and collaborate straight away. The immediacy of these platforms allows teams and clients to meet on incredibly short notice (regardless of where they’re based), helping them to respond to any urgent situations straight away. Of course, this sense of immediate collaboration will encourage remote teams to seek advice, feedback and work together much more frequently. If a problem arises while they’re working, they no longer have to wait for the next face-to-face meeting to resolve it, while also avoiding the inherent inefficiency of lengthy, confusing email chains. Web conferencing ensures remote workers never lose connection with the rest of their team, allowing them to chase up and resolve any queries without delay, and ultimately keep driving projects forward.